Feed antioxidants are used as additives for feed for various types of livestock. Feed antioxidant are gaining popularity due to the global increase in costs of feed. They also help in improving the animals’ disease resistance. 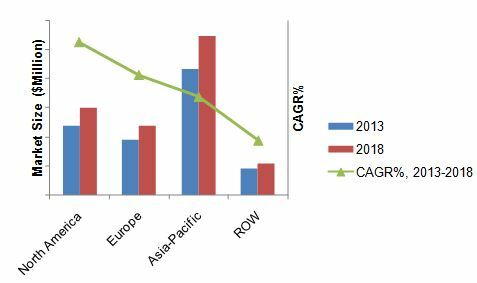 The global feed antioxidants market is growing at a steady pace, and the market is projected to continue growing in the future as the breeders want to increase the shelf life of feed to minimize wastages. Antioxidants are very effective in reducing the feed costs. Asia-Pacific is the largest consumer of feed antioxidants in the world, accounting for more than 45% of the consumption. North America is estimated to be growing rapidly in terms of market value. Growth is particularly high in markets such as China, India, and Brazil as they are countries with hot and humid climate and the livestock industry in these countries is also flourishing.. The poultry industry comprises of the largest market share for feed antioxidant, followed by the swine breeding industry. The driving factor of the feed antioxidant market is the global increase in cost of feed. The restraints for the market are the ongoing debate regarding the role of antioxidants in shielding the cancer producing cells in the body from the body’s defense mechanism. Also, the animal breeders in crisis-hit Europe are reluctant to use expensive feed additives for their animals. Leading manufacturers are focusing on the expansion of their businesses across regions and setting up new R&D plants for developing new production techniques and products. We have used various secondary sources such as encyclopedias, directories, and databases to identify and collect information useful for this extensive commercial study of the feed antioxidants market. The primary sources–experts from related industries and suppliers–have been interviewed to obtain and verify critical information as well as to assess the future prospects of animal feed antioxidant. To capitalize on the growth trend in the global feed antioxidants market, several leading companies are investing in the development and manufacture of animal feed antioxidant. The growing demand for feed antioxidants is forcing the global players to add feed antioxidant to their product offerings. We have also profiled leading players of this industry with their recent developments and other strategic industry activities. These include BASF SE (Germany), Impextraco (Belgium), Cargill, Inc. (U.S.), and Kemin Industries (U.S.). The market for feed antioxidants is estimated to reach $238.5 million by 2018, with a projected CAGR of 4.5% from 2013 to 2018. Feed antioxidant are organic compounds that are combined with basic feed mix to improve the shelf life of feed. These help in reducing the rate of oxidation of feed, thus preventing wastage of feed. This helps the farmer, in a long run, to bring down feed costs, thus increasing profitability. A variety of feed antioxidant are available, which are used in different concentrations depending upon the environmental factors and the type of feed. The type of feed antioxidant that is mostly used in feed grade of animals is BHA. Asia-Pacific is the largest consumer of feed antioxidants in the world. Growth observed to be particularly high in emerging countries such as China, India, and Brazil, due to industrialization, and rising protein and meat consumption. U.S. is the largest market in North America for feed antioxidants. 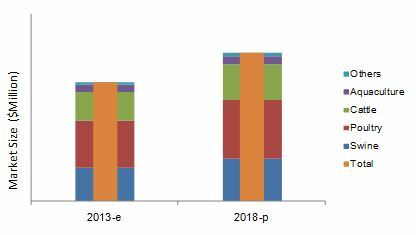 The feed antioxidant market is growing steadily due to the global increase in feed prices. The other driving factors for the market are the increasing awareness among animal breeders regarding role of feed antioxidants in bringing the overall cost of the feed down and the increasing preference for antioxidants due to its disease resistant characteristics. The restraining factor for the market is the ongoing debate about the role of antioxidants in shielding cancer producing cells from body’s defense mechanism. However, new technology in the feed antioxidant segments, such as antioxidants being used as mould inhibitors, provide future opportunities to the market. Key participants in the global feed antioxidant market are BASF SE (Germany), Cargill, Inc. (U.S.), Kemin Industries (U.S.), Royal DSM N.V. (The Netherlands), and ADM (U.S.). The feed antioxidant market is witnessing rapid developments in the areas of product innovation and new technologies, with a focus on increasing efficiency in livestock production. Leading companies are focusing on expansion of the business across regions and setting up new R&D centers for carrying out extensive research. Large amount of investments are made by European companies in the Asia-Pacific region to set up new production units to cater to the rising demand in Asia.